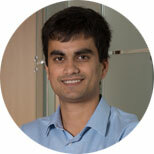 Aniruddha (Ani) Deshpande, MPH, is a Research Scientist on the Geospatial Analysis research team at IHME. His research focuses on geospatial estimation of water, sanitation, and hygiene (WASH) using model-based geostatistics and the study of emerging infectious diseases with pandemic potential. Aniruddha received his MPH in Global Epidemiology at the Rollins School of Public Health at Emory University and a BS in Biology and Philosophy at Emory University. He has previously worked at the Global Immunization Division of the Centers for Disease Control and Prevention (CDC) and the Center for Global Safe Water, Sanitation, and Hygiene (CGSW) at Emory University. His research interests include WASH, climate change, infectious disease modeling, epidemiological methods, spatial statistics, and impact evaluation.